The thyroid gland is the first of the body's endocrine glands to develop, on approximately the 24th day of gestation. The thyroid originates from two main structures: the primitive pharynx and the neural crest. The rudimentary lateral thyroid develops from neural crest cells, while the median thyroid, which forms the bulk of the gland, arises from the primitive pharynx. The thyroid gland forms as a proliferation of endodermal epithelial cells on the median surface of the developing pharyngeal floor. The site of this development lies between 2 key structures, the tuberculum impar and the copula, and is known as the foramen cecum. The thyroid initially arises caudal to the tuberculum impar, which is also known as the median tongue bud. This embryonic swelling develops from the first pharyngeal arch and occurs midline on the floor of the developing pharynx, eventually helping form the tongue as the two lateral lingual swellings overgrow it. The foramen cecum begins rostral to the copula, also known as the hypobranchial eminence. This median embryologic swelling consists of mesoderm that arises from the second pharyngeal pouch (although the third and fourth pouches are also involved). The thyroid gland, therefore, originates from between the first and second pouches. The initial thyroid precursor, the thyroid primordium, starts as a simple midline thickening and develops to form the thyroid diverticulum. This structure is initially hollow, although it later solidifies and becomes bilobed. The stem usually has a lumen, the thyroglossal duct, that does not descend into the lateral lobes. The 2 lobes are located on either side of the midline and are connected via an isthmus. The inferior parathyroid glands are also known as parathyroid IIIs, because they arise from the dorsal wing of the third pharyngeal pouch. Similarly, the superior parathyroid glands are also known as parathyroid IVs, because they arise from the dorsal wing of the fourth pharyngeal pouch. An image of the superior parathyroids can be seen below. The initial descent of the thyroid gland follows the primitive heart and occurs anterior to the pharyngeal gut. At this point, the thyroid is still connected to the tongue via the thyroglossal duct. The tubular duct later solidifies into a cord of cells that will form the follicular elements. The proximal segment retracts and subsequently obliterates entirely, leaving only the foramen cecum at the posterior aspect of the tongue. Nonetheless, in some individuals, remnants of this duct may still persist. The foramen cecum represents the opening of the thyroglossal duct into the tongue; its remains may be observed as a small blind pit in the midline between the anterior two thirds and the posterior third of the tongue. A pyramidal lobe of the thyroid may be observed in as many as 50% of patients. This lobe represents a persistence of the inferior end of the thyroglossal duct that has failed to obliterate. As such, the pyramidal lobe itself may be attached to the hyoid bone, similar to a thyroglossal duct cyst, or may be incorporated into a thyroglossal duct cyst. The caudal segment of the thyroglossal duct develops as a bilobed, encapsulated gland while reaching its final, orthotopic position. The caudal segment of the thyroglossal duct undergoes histologic differentiation into follicular elements at gestational weeks 10 and 11. The division of these primary follicles results in follicle formation during weeks 11 and 12. Intracellular canaliculi form connections with adjacent cells and these spaces subsequently fuse, forming a confluent lumen. Desmosomes, molecular complexes of adhesion proteins, connect the cells, keeping follicular contents confined within the lumen. Colloid then accumulates within the follicles during gestational week 13. For further reading, please see the Medscape Reference article Thyroid Anatomy. The ultimobranchial body develops from the pharyngeal endoderm and in turn gives rise to the parafollicular cells. Also known as C cells, these are a special subset of cells within the thyroid gland that secrete calcitonin, a hormone necessary for the regulation of calcium. The ultimobranchial body represents the last structure derived from the branchial pouches (also called pharyngeal pouches); hence its name. It arises from the fifth pharyngeal pouch, which is alternately described as the ventral portion of the fourth pharyngeal pouch. (Whether fifth pharyngeal pouches actually exist is debatable.) The ventral portion of the fourth pharyngeal pouch attaches to the posterior aspect of the thyroid at the fifth week of gestation and increases the weight of the thyroid by 30%. Although it was previously thought that neural crest cells invaded the ultimobranchial body and consequently gave rise to C cells, subsequent research has indicated that the C cells are actually endodermal in origin. It is now believed that once pharyngeal pouch endoderm gives rise to ultimobranchial body epithelial cells, the epithelial cells disseminate, following fusion, into the parenchyma of the embryonic thyroid and form C cells. The thyroglossal duct is an epithelialized, ductlike structure that connects the developing thyroid gland and the foramen cecum. During the fifth week of development, this structure loses its lumen and breaks into fragments. The mesoderm condenses, forming the hyoid bone, which subsequently undergoes chondrification. This development divides the thyroglossal duct intro suprahyoid and infrahyoid divisions. The attenuated duct then atrophies by the end of gestational week 8. Most cases of ectopic thyroid are detected in early childhood and may be associated with hypothyroidism. The tissue may enlarge due to an elevation of thyroid-stimulating hormone (TSH), resulting in localized symptoms. If present in the anterior neck, the enlarged tissue may be mistaken for a TDC. It is important to differentiate between these lesions, as THS-related enlarged tissue is frequently the only thyroid tissue present. The thymus and parathyroids both lose their connections to the pharynx at gestational week 7. The thymus then migrates caudally and medially, pulling the parathyroids with it; therefore, parathyroid IIIs are in a more inferior position than are parathyroid IVs. The parathyroids, in turn lose their connection with the thymus. The inferior parathyroid glands usually stop at the dorsal surface of the thyroid gland, outside of the fibrous capsule of the gland itself. An image of the inferior parathyroids can be seen below. The superior parathyroid glands are also known as parathyroid IVs, because they arise from the dorsal wing of the fourth pharyngeal pouch, differentiating at gestational weeks 5-6. The fourth pharyngeal pouch and the rudimentary fifth pouch form the caudal pharyngeal complex; together they contribute to the formation of the ultimobranchial body. Due to this close origin with the lateral thyroid, the superior parathyroids are sometimes called the thyroid parathyroids. At gestational week 7, the glands lose connections with the pharynx and attach themselves to the thyroid gland, which is migrating caudally. However, it migrates far less than the thymus (with parathyroid IIIs, as described above). 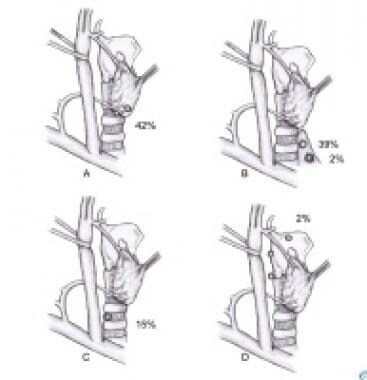 Because of the shorter migration length, the superior parathyroid glands (IV) are in a more constant location than the inferior parathyroids (III). The superior parathyroids are generally located more posterior and medial than the inferior parathyroids, and their final resting point is usually on the dorsal surface of the thyroid gland, outside the fibrous capsule of the thyroid gland. An image of the superior parathyroids can be seen below. Accessory or supernumerary parathyroid glands are found in approximately 13% of individuals at autopsy. These glands most likely result from tissue fragmentation that occurs during the migration of the glands rather than from an initial division of the primordia of the glands themselves. Separation of cells from the main mass during the migratory process produces microscopic rests, or fragments, of ectopic tissue. Rudimentary rests of parathyroid tissue can be differentiated from true supernumerary glands based on size. The former typically weigh less than 5 mg, while true supernumerary glands have an average weight of 24 mg.  Primary and secondary hyperplasia may result in stimulation of embryologic fragments, resulting in the development of supernumerary glands proper. Absence of parathyroids (ie, < 4 glands) is noted in approximately 3% of individuals at autopsy. This absence may result from a failure of the primordia to differentiate into parathyroid glands or may be the result of parathyroid gland atrophy early in development. Ectopic parathyroid glands occur in 15-20% of patients. The glands may be located anywhere near or even within the thyroid or thymus. For example, if parathyroid IVs do not descend entirely, they may be located as high as the bifurcation of the common carotid artery. Conversely, if parathyroid IVs do not release from the thymus, they may be located intrathoracically, as low as the aortopulmonary window. Other common ectopic locations include the anterior mediastinum, posterior mediastinum, and retroesophageal and prevertebral regions. However, even when the parathyroid glands are in an ectopic location, they still often are symmetrical from side to side, making localization somewhat easier. Ectopic location may also be acquired due to enlargement of a gland, with gravitational forces causing migration, or as a result of regional dynamics, such as laryngeal movement during swallowing or the influence of negative intrathoracic pressure. Congenital ectopias are generally caused by anomalies in the migration of parathyroid IIIs, whereas acquired ectopias usually affect parathyroid IVs. In some cases, after adhering to the thyroid capsule, the parathyroid gland may actually enter the thyroid gland and embed there, rather than remain outside the gland. This situation results in an intrathyroidal parathyroid gland. The underlying origin of this phenomenon has not yet been elucidated. However, it has been concluded that parathyroid IIIs and IVs and supernumerary glands can all be the source of intrathyroidal parathyroid glands. DiGeorge syndrome manifests as congenital thymic aplasia and absent parathyroid glands. This syndrome results from failure of the third and fourth branchial pouches to differentiate. DiGeorge syndrome is also associated with facial abnormalities from abnormal development within first arch structures. No genetic cause is known, but teratogens are the assumed mechanism. Symptoms include neonatal tetany and impaired cellular immunity with normal humoral immunity. Takanashi Y, Honkura Y, Rodriguez-Vazquez JF, et al. Pyramidal lobe of the thyroid gland and the thyroglossal duct remnant: A study using human fetal sections. Ann Anat. 2015 Jan. 197:29-37. [Medline]. Guerra G, Cinelli M, Mesolella M, et al. Morphological, diagnostic and surgical features of ectopic thyroid gland: a review of literature. Int J Surg. 2014. 12 Suppl 1:S3-11. [Medline]. Gauger PG, Delbridge LW, Thompson NW, et al. Incidence and importance of the tubercle of Zuckerkandl in thyroid surgery. Eur J Surg. 2001 Apr. 167(4):249-54. [Medline]. Johansson E, Andersson L, Ornros J, et al. Revising the embryonic origin of thyroid C cells in mice and humans. Development. 2015 Oct 15. 142 (20):3519-28. [Medline]. [Full Text]. Ward GE, Hendrick JW, Chambers RG. Thyroglossal tract abnormalities, cysts and fistulas; report of 105 cases from the Johns Hopkins Hospital observed during the years 1926 to 1946. Surg Gynecol Obstet. 1949 Dec. 89(6):727-34, illust. [Medline]. Rossi ED, Martini M, Straccia P, et al. Thyroglossal duct cyst cancer most likely arises from a thyroid gland remnant. Virchows Arch. 2014 Jul. 465(1):67-72. [Medline]. Amos J, Shermetaro C. Cyst, Thyroglossal Duct. 2018 Jan. [Medline]. [Full Text]. Organ GM, Organ CH Jr. Thyroid gland and surgery of the thyroglossal duct: exercise in applied embryology. World J Surg. 2000 Aug. 24(8):886-90. [Medline]. Ross J, Manteghi A, Rethy K, Ding J, Chennupati SK. 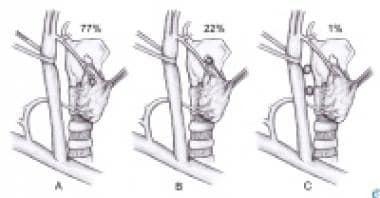 Thyroglossal duct cyst surgery: a ten-year single institution experience. Int J Pediatr Otorhinolaryngol. 2017 Oct. 101:132-6. [Medline]. McCoul ED, de Vries EJ. Concurrent lingual thyroid and undescended thyroglossal duct thyroid without orthotopic thyroid gland. Laryngoscope. 2009 Oct. 119(10):1937-40. [Medline]. Nilsson M, Fagman H. Mechanisms of thyroid development and dysgenesis: an analysis based on developmental stages and concurrent embryonic anatomy. Curr Top Dev Biol. 2013. 106:123-70. [Medline]. Mohebati A, Shaha AR. Anatomy of thyroid and parathyroid glands and neurovascular relations. Clin Anat. 2012 Jan. 25(1):19-31. [Medline]. Henry JF. Applied embryology of the thyroid and parathyroid glands. Randolph GW, ed. Surgery of the Thyroid and Parathyroid Glands. Philadelphia: Saunders; 2003. 12-20. Akerström G, Malmaeus J, Bergström R. Surgical anatomy of human parathyroid glands. Surgery. 1984 Jan. 95(1):14-21. [Medline]. Thompson NW, Eckhauser FE, Harness JK. The anatomy of primary hyperparathyroidism. Surgery. 1982 Nov. 92(5):814-21. [Medline].